A veteran NASA executive, most recently director of the John H. Glenn Research Center in Cleveland, has been named director of the University of Central Florida’s Florida Space Institute. Ramon “Ray” Lugo III is taking over as the space institute begins a new era of positioning Florida and the nation to be leaders in the space industry. “It’s a very exciting time to be in the business of space and I’m especially excited to be returning to the place where I discovered my passion for the field,” said Lugo, who received his Bachelor of Science degree in engineering at UCF in 1979. Lugo’s space career started at NASA’s Kennedy Space Center in 1975 when he was a cooperative education student while attending UCF. Lugo’s specialty at Kennedy Space Center was managing, directing and evaluating the process of all ongoing launch operations and activities including Expandable Launch Vehicles engineering and analysis, payload integration, launch site support and launch campaigns. 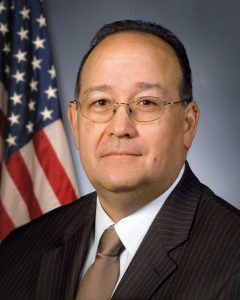 He has served as executive director of the Cape Canaveral Spaceport Management Office, Director and Deputy Director of the Expandable Launch Vehicle Services Program, Manager of Facilities and Support Equipment Division in the Space Station Program Office and Chief of the Joint Performance Management Office. The Florida Space Institute is part of a broad statewide partnership begun 22 years ago to support Florida’s involvement in the burgeoning field of space exploration. The end of the space shuttle program in 2011 and the subsequent debate over America’s future involvement in space has coincided with recent changes at FSI. In 2010, FSI named an interim director, S. Alan Stern, who oversaw relocation from Cape Canaveral to the Central Florida Research Park and a re-emphasis on the center’s space research and education mission. In recent months the center has funded $400,000 in research projects designed to stimulate space research in areas as diverse as physics, chemistry, Nano science and electrical engineering. MJ Soileau, vice president for research & commercialization at UCF, said he is grateful for Stern’s service and happy to have Lugo back at the university. “Ray is going to be a fantastic FSI director, with all of the management skills, innovative outlook, high energy level, and deep space program connections to make FSI and all of UCF soar,” Soileau said.